Brentwood real estate is mostly made up of established and older homes between 70-90 years old. The age of the homes also appeal to builders for tear downs. There is currently a small percentage of Brentwood MO homes for sale that are new construction on beautiful established lots. The single family homes offer floor plans with 2 bedroom, 3 bedroom or 4 bedroom options. Brentwood MO homes for sale range in price from approximately $150,000 to approximately $555,000. The median home price in 2014 was approximately $370,000. Residents of Brentwood MO real estate enjoy family recreation at the Brentwood Ice Arena an indoor rink that is open year round. Brentwood also maintains eight parks with a variety of facilities for the public to enjoy at no cost. One of the larger parks is Brentwood Park, it is 13.5 acres in size and provides a stadium like baseball field. The park also holds two softball fields, two soccer fields, restrooms, a playground, and a pavilion. Brentwood Park is home to Brentwood Eagles baseball and softball, the Annual Brentwood Days Festival and the summer concert series. Shopping is even made more convenient with one-stop-shopping such as Brentwood Square home of Arhaus Furniture, Whole Foods, REI and Nordstrom’s Rack. The St. Louis Galleria is located just 1 mile north of Brentwood and has some of the best shopping and dining St. Louis has to offer. Residents of Brentwood MO have the convenience of numerous tasty restaurant choices including; O.B.Clarks, Applegate’s Deli, Frank Papa’s Ristorante or The Pasta House Co. and Pronto just to name a few. The Brentwood School District serves Brentwood MO real estate. Parents will be pleased to know that one of the elementary schools, Mark Twain, received the Missouri Gold Star and is a current Missouri School of Character. Brentwood is also home to Brentwood High School, a 2006 and 2013 National Blue Ribbon Award winner. If you’re interested in learning more about the homes for sale in Brentwood MO, please contact St Louis County real estate expert, Sharon Colona and St. Louis Realty for a professional and simple buying or selling process. Call (636) 397-7653 or email at scolona@stlouisrealty.net. Here is your opportunity to own a new construction home in Brentwood w/ award winning schools. From the inviting curb appeal to stunning craftsman style finishes throughout, you will be impressed. Home features approx 2,365 sq ft of finished living space w/ 2-car garage. Some finish features include: covered front porch; rich mahogany front door; open floor plan; 9' ceilings on first floor; hardwood floor on first floor & second floor hallway; porcelain tile in baths; 6 base trim throughout & crown molding in great room/kitchen areas; kitchen w/ walk-in pantry/custom cabinetry/center island/solid surface countertops; custom built-ins flanking the great room gas fireplace; mud room w/ custom built-ins; composite decking off kitchen area. Upstairs, you will find 4 bedrooms, 2 baths & convenient laundry room. The master bdrm suite includes a walk-in closet & private bath. Located near schools, shopping, restaurants, hospitals, downtown Clayton & short drive to downtown St. Louis. Brentwood is the x201C;City of Warmth x201D; and so is the warmth and memories this house will create with your family and friends. Brentwood is 12 minutes from cultural attractions, shopping and transport hubs. The schools are some of the best in the state. The first floor is open with the kitchen/den and is all hardwoods. The windows open up a view to the large, spacious and private back yard. The kitchen is modern and bright with stainless appliances. A gas fireplace becomes the focal point for entertainment on cold winter nights while sipping a glass of wine while watching the snow fall. The partially finished basement with built in surround sound is a great place for kids to play or for families to enjoy movie night! The 2nd floor features a large master suite and a spa like bathroom. Both upstairs bathrooms have been renovated with concrete counter tops and custom carpentry trim made by the owner. This home is an exceptional value with features found on more expensive custom homes. Located on one of the few quiet non-thru streets in Brentwood's desirable Parkridge neighborhood, this spacious 2200+ sq ft home offers great space for today's lifestyle. Upon entering, one is greeted by a separate foyer w/open staircase to 2nd floor & large archway leading to the living room. This gracious light filled living room has a wood burning fireplace, built-in bookcase, wood floor & archway opening to the dining room for wonderful flow. The NEW in 2019 large kitchen features off-white cabinets, quartz counters, marble backsplash, tile floor & stainless appliances w/access to the dining room, huge main floor family room addition w/gas fireplace and updated guest bath w/new tile floor in 2019. Upstairs finds 3 good sized bedrooms w/wood floors & hall bathroom which also opens to the master. Other updates & features include: refinished wood floors, new carpet 2018 in family room, w/o basement, large deck, great yard, new roof & siding in '15, insulated windows & much more! If you are looking for a house with character and NOT a cookie cutter, Welcome Home! This home offers 1.5 stories, 3 bedrooms, 2.5 bathrooms and a 1 car garage. The main floor offers a living room with plenty of natural light through the bay window. There is a formal dining room, kitchen with breakfast bar, two bedrooms, office/den, a full bathroom and a large room addition/sun room for family gatherings with access to the fenced level backyard that includes a deck and patio, perfect for outside entertaining. For when you want x201C;me x201D; time the master bedroom suite is located on the upper level and is large enough for a king size bed and sitting area with room left over. The large master bath has separate shower and bathtub. The lower level has a half bath and is ready for your imagination. This home is located in the Parkridge subdivision. 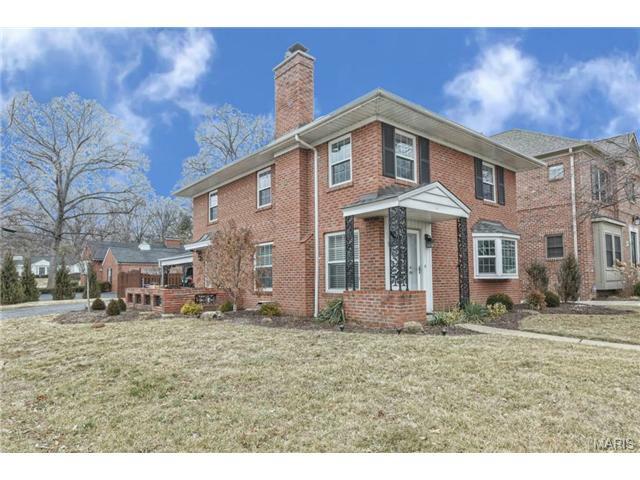 Within walking distance to Tilles Park and Brentwood schools. Close to all of the amenities that Brentwood has to offer and I-64/170. This charming and updated home is centrally located. It is close to the St. Louis Galleria, other shopping centers, Washington University, Saint Louis Unversity, major hospitals. The home is also within walking distance to parks and schools. The home has hardwood floor on the main level, stained glass and thermal windows, updated kitchen and bath as well as zoned heating and cooling. The kitchen is open to a dining area. A a nice deck and deep back yard provides a nice retreat for entertaining guests and fiends. xD; xA; xD; xA;All new carpet for the stairs, upstairs bedroom and hallway was installed in August, 2018. The new granite countertop, sink and faucets were installed in November, 2018.